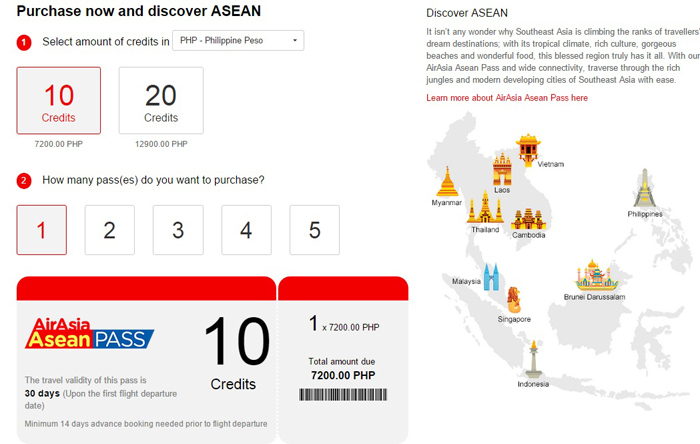 In summary, it's a travel pass (consisting of credits which could be converted to flights) that allows travelers to book lower fares to more than 140 routes all across Asia. Refer to image above as to which countries are included. No Japan, Korea, Hongkong, Taiwan, China ganern places okay? Haha. 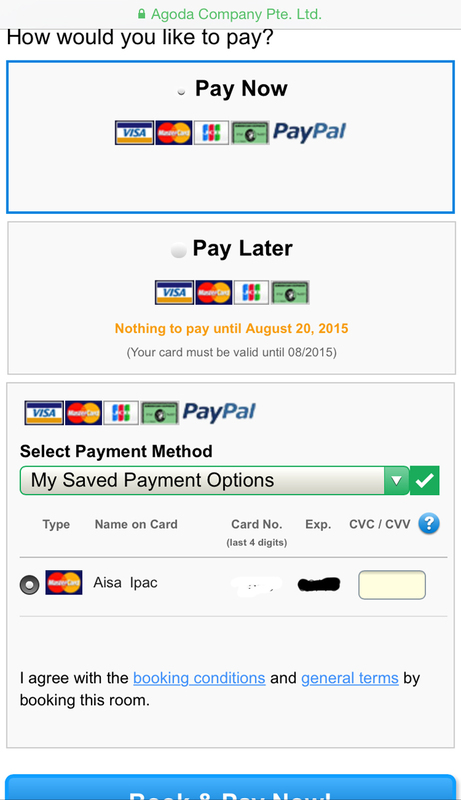 You could buy 10 credits for P7,200 which you need to consume in 30 days. The 30 days will start on your first flight date. Remember ha! Don't forget! Flights should be booked at least 2 weeks / 14 days in advance. If you have all the time in the world or you have 2 months worth of leave (wow ha anong office yan magaapply ako haha) then you could buy 20 credits for P12,900. The 20 credits is consumable naman in 60 days. QUESTION: Now what do I do with those credits???? 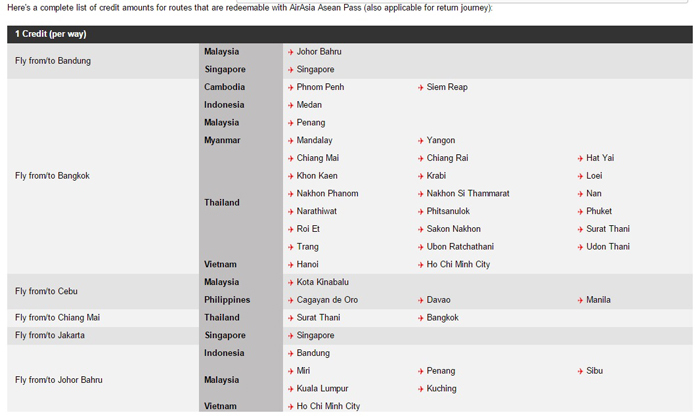 Eto na nga... these are the flights you could avail. Add, add nalang until you reach 10 or 20 credits. Haha. 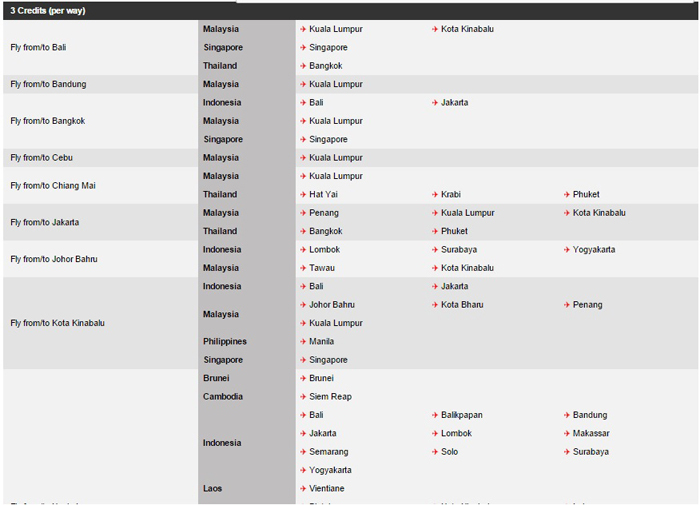 MANILA-KL (3) + KL-Phuket (1) + Phuket-Bangkok (1) + Bangkok-Penang (1) + Penang-KL (1) + KL-Manila (3) = 10 credits!!! In our case, I purchased the pass first and then I planned the itinerary after. It took me 2 weeks to finalize ha! Had to do extensive research, budgeting and endless discussion with Nico. Our main target was Bagan, MYANMAR so we built the whole trip around it. We originally planned to do cross country border crossing (Cambodia-Thailand-Laos-Vietnam-Myanmar-Malaysia) but upon research I found out it will take longer than I expected. I thought Cubao to Marikina lang eh. Very wrong! Haha! As for us, we only had 20 days, so we decided to trim down our itinerary. 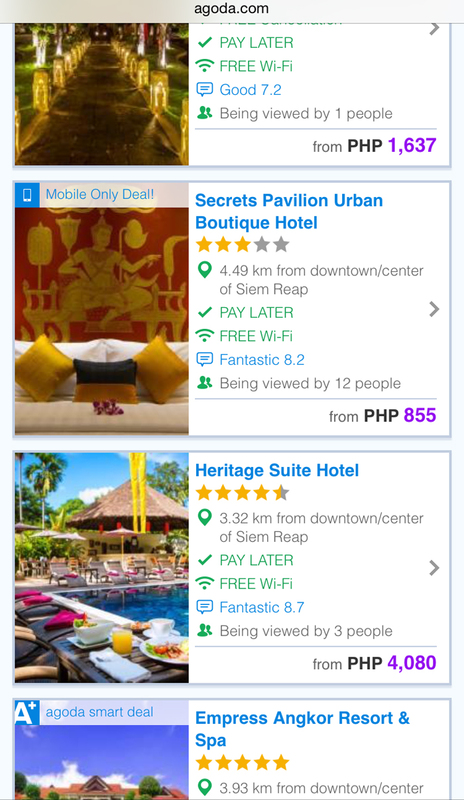 To be able to visit more countries, we decided to fly directly to Siem Reap, Cambodia via Cebu Pacific. From there, we took a bus going to Thailand and then took a plane going to Myanmar, Malaysia and back home. WHAT I DID WRONG: As I said, the 30 days will start on the date of your first flight. So I booked our first trip which was September 2, Bangkok-Mandalay and then booked our next 2 major flights (Mandalay-KL, KL-Manila). That's 7 credits total. 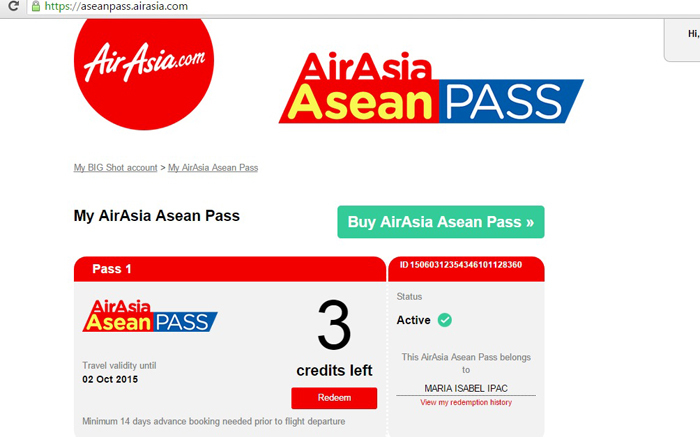 I thought I could still go back and book minor, intercity flights in between like Bangkok-Chiang Mai-Bangkok (2 credits total), but to my dismay that's not allowed pala! 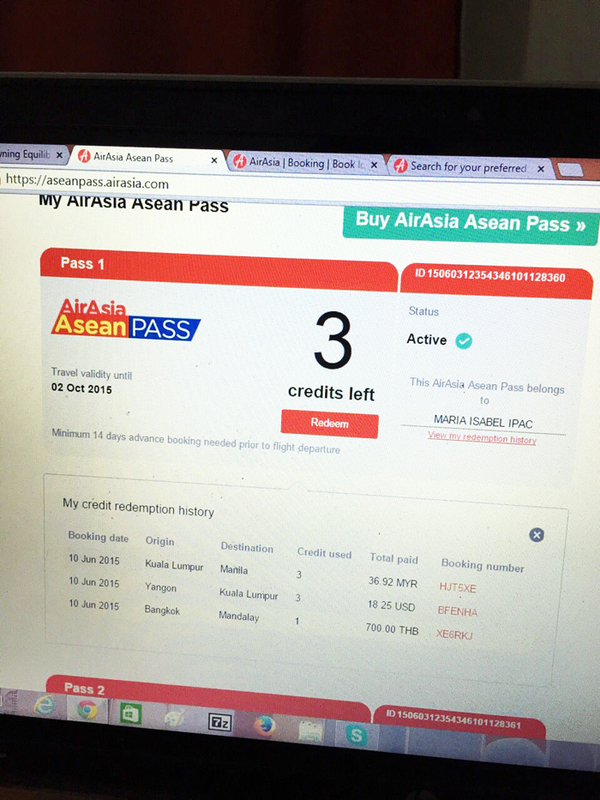 Since I booked our Sept. 11 KL-Manila flight na, I could use our remaining 3 credits nalang AFTER that. So September 12 - October 2. Good thing they also offer local flights! Since I have shoots scheduled, we weren't able to redeem na:( Sayang, we could use it sana to go to Cebu, Tagbilaran, Palawan, Davao, Boracay or Tacloban sana. Oh, well. AIRPORT TAXES & FEES: If you check my credit redemption history, there's a column that says "TOTAL PAID". Those are airport taxes & fees. 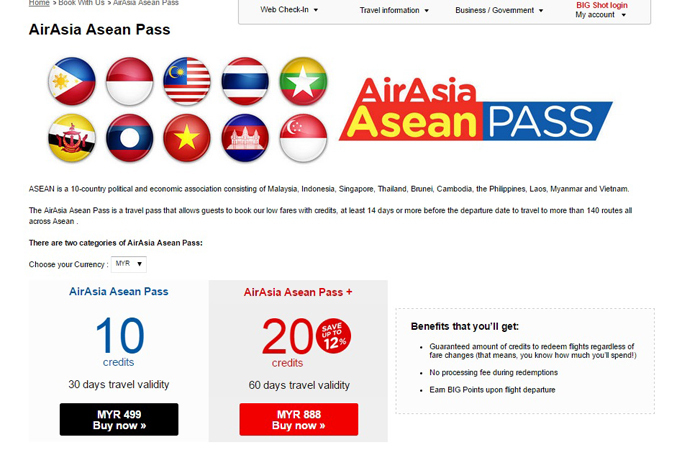 That's not included in the Asean pass amount. I paid more or less P2,100 in total. 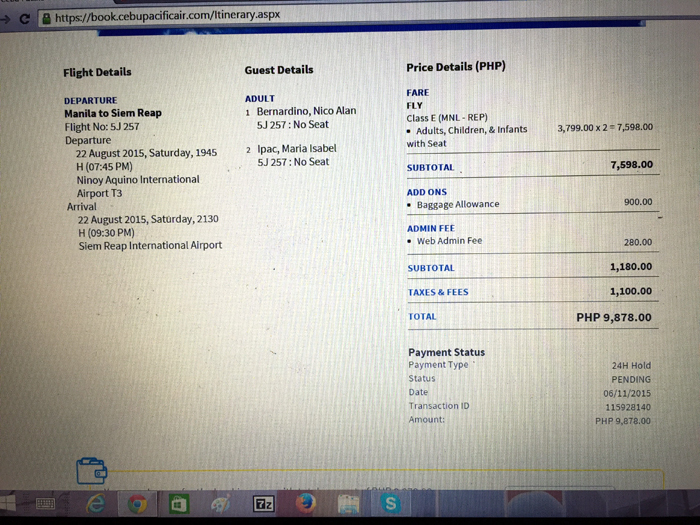 Now that I think of it, if I could turn back time, I wouldn't book na this CebuPac ticket. Why? Well, I tried to come up with a better itinerary (as in now lang while creating this post, WHYYYYY) where we would be able to save more money. HERE O! 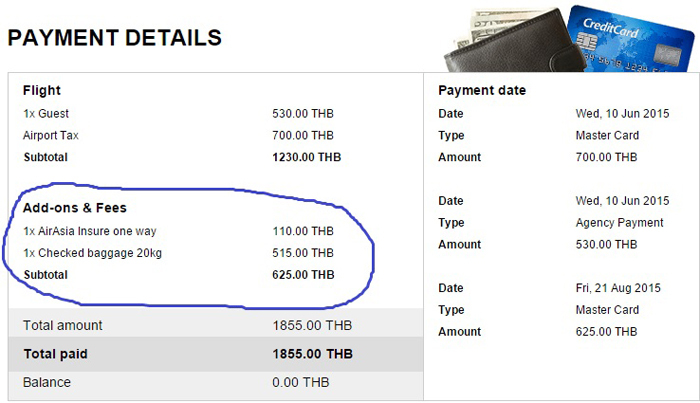 Manila-KL (3 credits) + KL-Siem Reap (224 MYR or P2,370 for one way each person) + Bangkok-Mandalay (1 credit) + Yangon-KL (3 credits) + KL-Manila (3 credits) = 10 freakin' credits!!! Gaaah! Shet db? P4,740 vs P9878. We would have saved more or less P5,140!!! Huhuhuhu. Lesson learned. 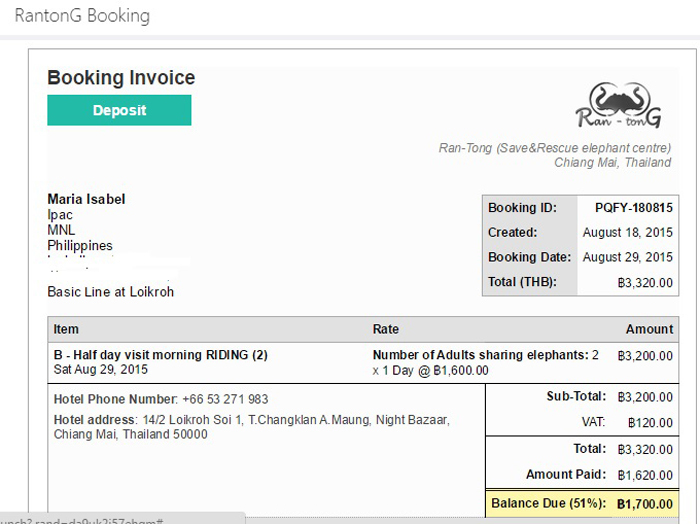 The Ran-Tong Elephant Sanctuary tour I booked online because I was not sure if we will be able to book this tour when we get to Chiang Mai. It is by reservation so I wanted to secure a slot before we get there. 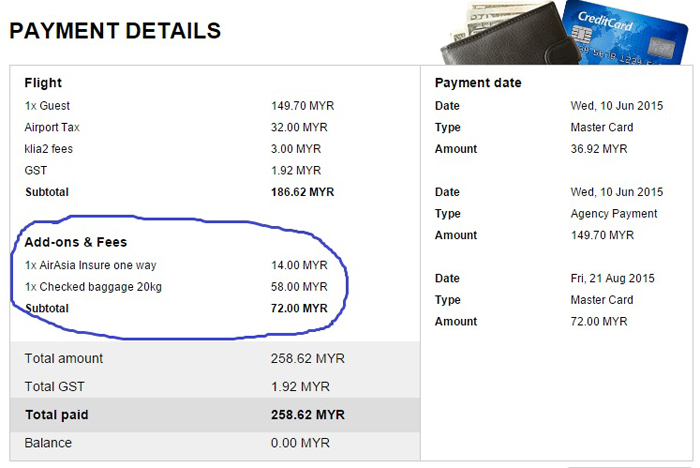 I only paid 50% downpayment online and the balance we paid when we got to the sanctuary na. 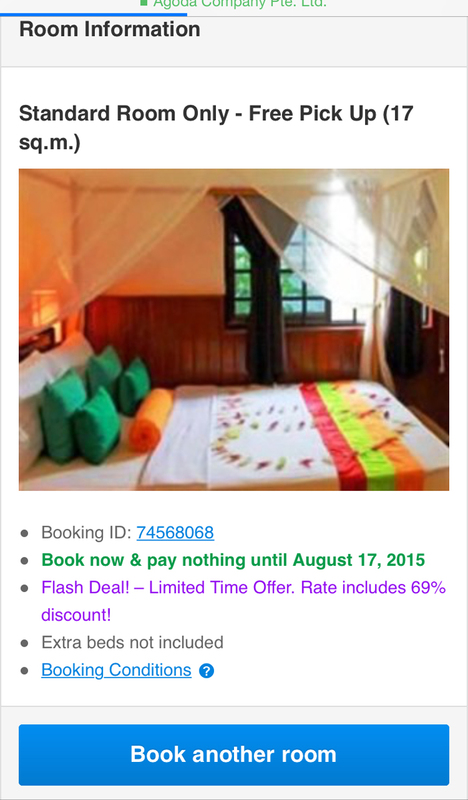 I was searching for Chiang Mai tours when I came across Travel Hub's page. 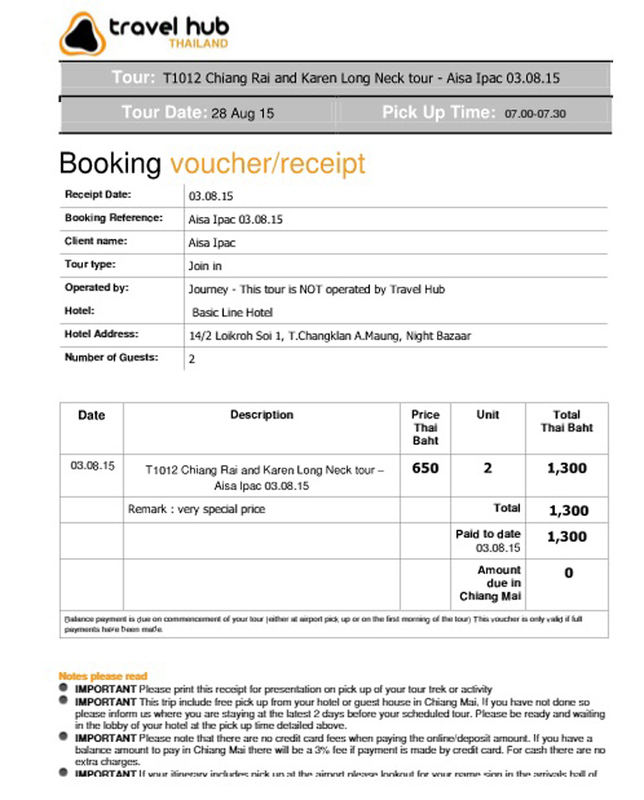 There are other websites that offer the Karen Long Neck tour but it's more expensive and the itinerary is not that great. 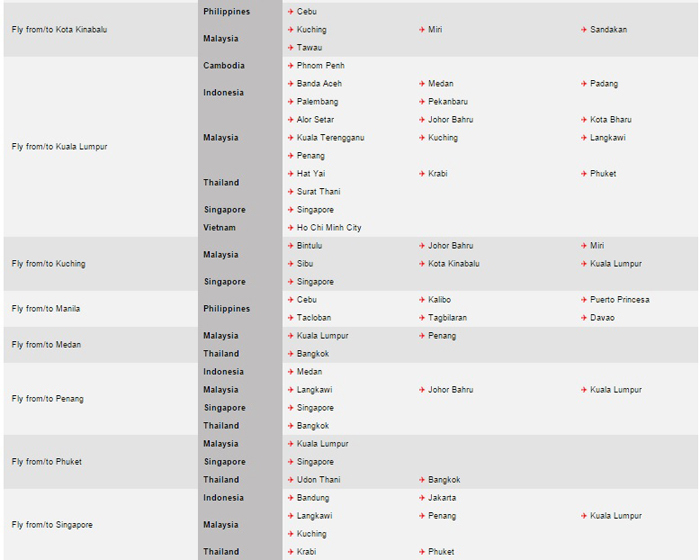 Travel Hub's itinerary is jampacked and focuses on major spots. It's great. They also offer generous discounts to bloggers! I just saw the partnership announcement on their page and tried my luck. Sinwerte naman! They responded a day after and they were very kind and accommodating. Anyway, the tour was operated by JOURNEY Co. tours and it was super organized and fun. So glad I booked this tour. Super worth it and hassle free! Not sure if you could DIY this tour but the places are 1-3 hours away from each other. They also provided us free lunch and water! Win. These are the only tours I booked! So proud of myself haha. The normal me would obsess over booking tours online, but the jowa influenced me to do it spontaneously. I am not really a fan of spontaneous when it comes to touring other countries, so I still researched and read tons of TripAdvisor comments and read travel blogs just to have an idea on how to reach certain places while still doing it ourselves. There were instances when we had to improvise and do some major exploration on our own. Turned out to be fun. Oha. Compromise! Relationship goals na kami nun! Wahaha joke. I don't know if I love or hate packing (I'm SURE I hate unpacking), but I would say this is the most challenging thing for me whenever I travel. Haha! For this 20-day trip, I planned ahead and decided to bring lightweight clothes. I bought a few clothing pieces on super sale and recycled clothes in my closet. Mix and match to the highest level! Some people suggested na I bring lang tanktops, shirts and shorts, but, you know me, I can't do that. Haha! A week before leaving, I started making na my outfit list - 22 sets for 20 days. Oha, may extra pa na 2. Haha! Unfortunately, I still had to resort to washing my clothes in the bathroom and going to a laundry shop because even with all the list and preps, I still ran out of clothes. Haha. There were days when I really had to change because we got wet or we were so hulas from all the walking. It was a few degrees hotter there than in Manila. Huhu. 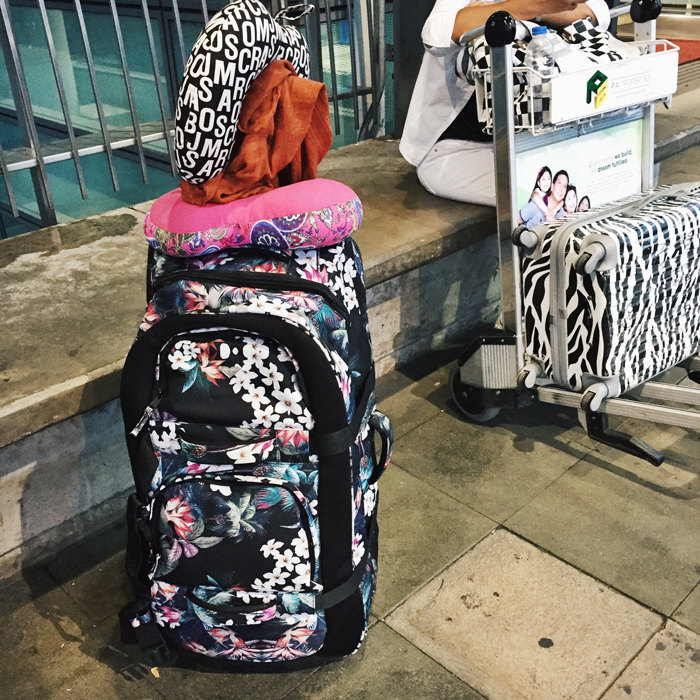 Anyway, this head-turning luggage from ROXY saved my life! ALL of my things fit inside with lots of room pa! Nico ended up stashing his things in my luggage when his hand-carry went over the weight limit. I love how this bag has lots of pockets and mesh/net cover on each side to secure my things. 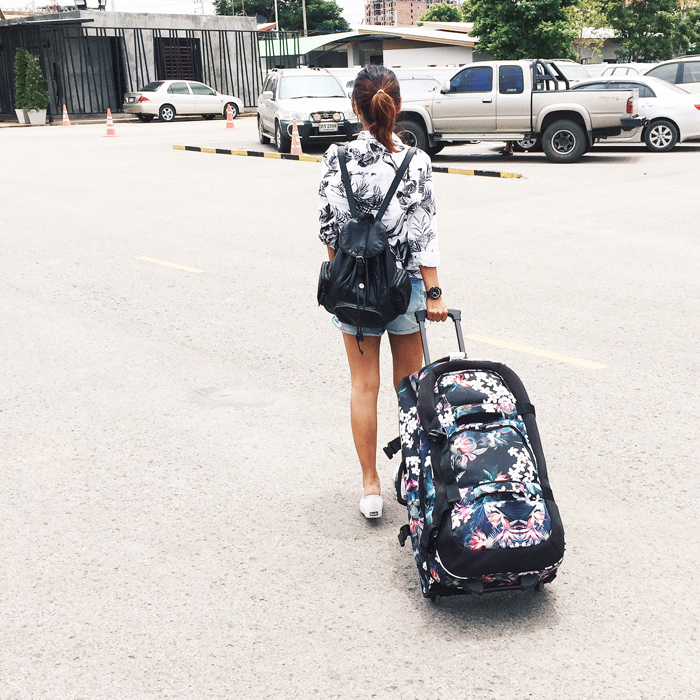 For 20 days, we had to hop from one hotel and one place to another so packing was a breeze. Naamaze din si Nico. Haha. I didn't have to worry of losing it too because of the distinct design. So easy to spot. Plus, it's such a babe. I love it. 3. White sneakers from Keds - goes with everything! 4. Towel - some hostels don't provide towels so I brought my Aquazorb towel. It dries easily! 5. Extra shopping bag from Herschel - which we used for handcarry and for carrying our stuff. 6. Sunnies - love my aviator from Avon and white vintage one from Nava. 10. Makeup - Revlon photoready powder, Sooperbeaute cheek tint, K-Palette 24 hr tattoo liner & lash perm mascara, Etude House brow gel, Benefit Highbeam highlighter. That's all! It was super hot so less is more. Two weeks before our trip, I started checking foreign exchange rates online. I wanted to have our money changed na but we decided to hold off muna coz the rate might get better. It did not. Haha! Anyway, had our pesos changed to dollars 3 days before leaving. Rate was P46 something per $1 then. Bought majority of our dollars from BPI and the rest from Czarina. TIP: It's better if you'll bring $100 bills when traveling because the exchange rate of $100 vs smaller bills like $50 and $20 is higher. Also, check your dollars. Make sure there are no stains or it's not even slightly crumpled. We had a hard time having our bills changed in Myanmar because they only accept bills that looks super new! No stains or folds. Nastress ako dun. Haha. Cambodia accepts dollars. Thailand only accepts baht. Myanmar accepts kyats or dollars. Malaysia only accepts ringgit. 7. 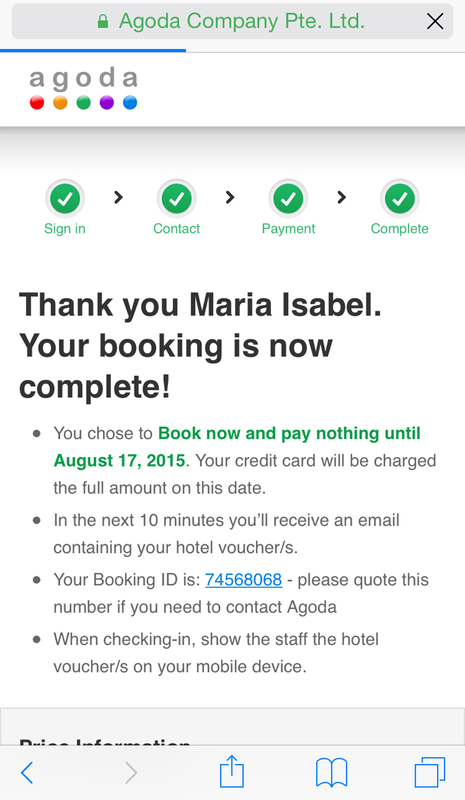 Booked hotels/hostels via AGODA! Why do I love AGODA? 1. Before booking an accommodation, I try to check other websites too. 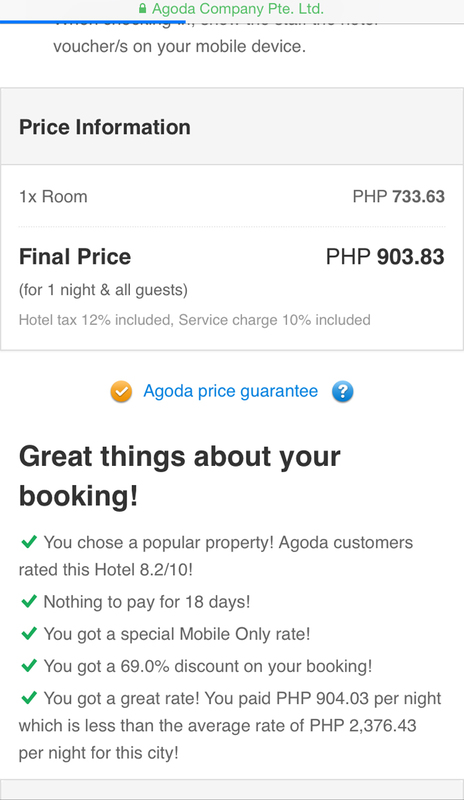 AGODA has the best deals and the lowest rates! 2. They offer secret deals for members. Woopie! 3. Ratings and Reviews that helps you decide which hotel/hostel to book. 4. You could sort your search results via Price, Ratings, Agoda Recommended, Area. Super useful! 6. Best Price Guarantee which I experienced first hand! 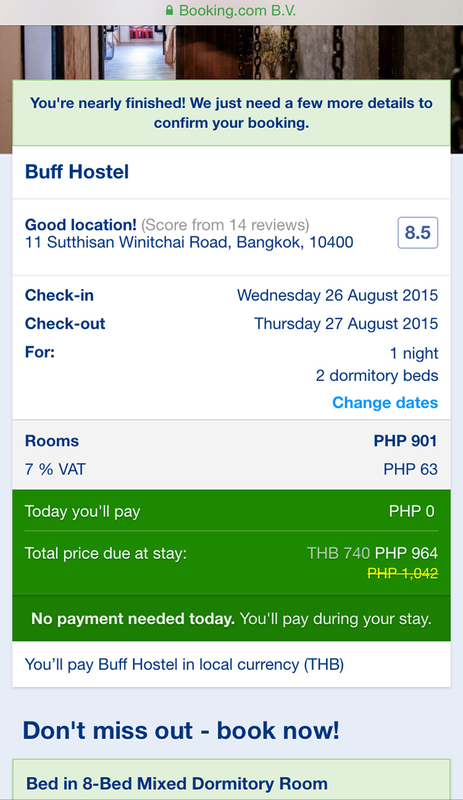 Booked 2 bunk beds in Buff Hostel, Bangkok Thailand. Total was P1,172 including taxes and fees. Checked Booking.com and their rate was cheaper! The Secrets Pavilion Urban Boutique Hotel, Siem Reap through Agoda offered 2 nights in a superior room for free. 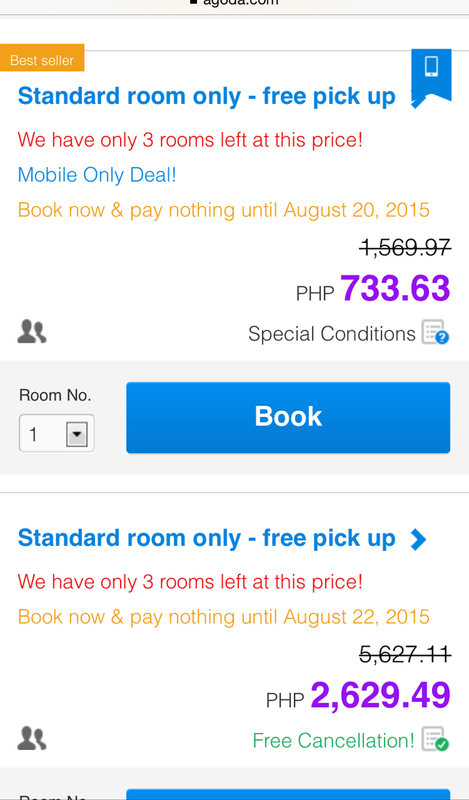 When I checked the hostel online, I was surprised to discover that their room rates are very affordable! So, I decided to book the rest of our stay there too. :) I booked the P900+ a night standard room and they were nice enough to offer an upgrade. Anyway, as I was saying, for P900 a night you get a nice room, resort feel hotel, beautiful pool, free internet and awesome service. 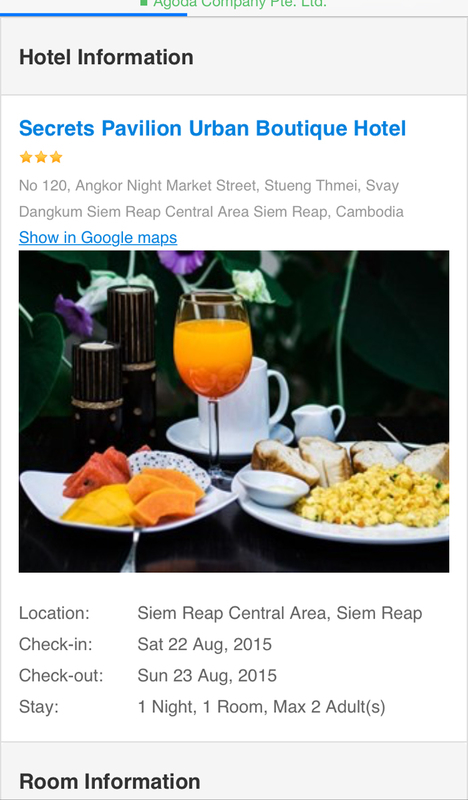 The hotel is also located near the Night Market! 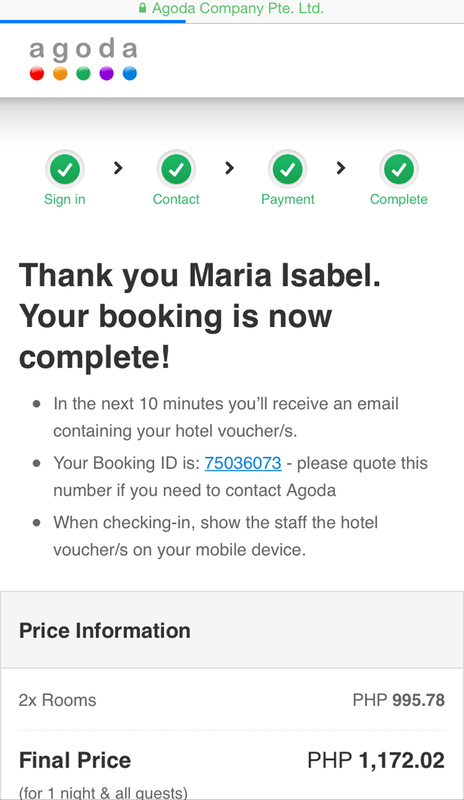 :) Booked a room in under 5 minutes using my mobile phone! P.S. Blogging about Cambodia next! Abangan!